We are going to rebadge the GeoTools add-on software for Bricscad and AutoCAD to better reflect what it offers to the end-user. We are going to split GeoTools into two products - GeoTools and CADPower, both for the AutoCAD and Bricscad platforms. From 1999, the year since GeoTools was first made available for AutoCAD, it offered specific tools for the geo-data and civil users. Over time, the software accumulated so many tools that we also started calling it as a general purpose productivity tool for CAD. Today, we have over 275+ tools in GeoTools, many of which are purely general CAD task tools and have nothing to do with geo- and civil. In its new avatar, the new GeoTools will contains tools that are relevant to the GIS, geography and Civil users only. This will also enable us to grow GeoTools and strengthen its position as a useful civil add-on for CAD. We know there is still a long way to go but we are on our way. All other general productivity tools will move over to CADPower, the name for the new CAD productivity add-on for Bricscad and AutoCAD. As for pricing, the USD 219 that is currently the price of a single-user license of GeoTools will be split between the two products in a ratio to be determined at the time of launch. There will be a small overlap in the functions between GeoTools and CADPower i.e some commands will be contained both in GeoTools and CADPower. Existing users of GeoTools will receive FREE licenses of CADPower at no extra cost. Users in India who purchase Bricscad from us will now receive a FREE license of CADPower for Bricscad, and not GeoTools. In my last post, I explained the lack of compatibility between Bricscad V12 Classic and GeoTools V12. There is an interesting observation I made regarding Bricscad trial version and Bricscad Classic. If you download a 30-day trial version of Bricscad and install it on your system, it runs as the highest end version, Bricscad Platinum in trial mode. This is the dialog box you see when you first start Bricscad in trial mode. When you are running a trial version of Bricscad, you can run GeoTools because it is the BRX-enabled Platinum version. Eventually, if you decide to purchase a Classic version of Bricscad, and enter the license for Classic, a number of features get disabled (like VBA, BRX, Direct Modeling etc). This results in GeoTools v12 no longer working in Bricscad Classic. This post is to clarify and for the benefit of those users who have done GeoTools trial with Bricscad trial version and found that it stopped working later in Bricscad Classic. GeoTools V12 will run on Bricscad V12 Pro and Platinum versions but not (yet) with the Classic version. This is because of a DOSLIB compatibility issue with the underlying Teigha libraries used in Bricscad V12. Background: GeoTools depends on DOSLIB DRX/BRX files for several essential system-support and related functions. In Bricscad V12 Pro and Platinum, there is no problem and we have DOSLIB BRX modules which are compatible. For the Classic version of V12, we do not yet have a compatible module to DOSLIB which will run on V12 Classic. Prior to V12, Bricscad was using the old DwgDirect libraries version 2.06. This enabled DRX files to be loaded in Bricscad. From V12 onwards, a new Teigha library v3.05 is used in Bricscad. This means that old DRX files can no longer run on Bricscad V12 and need to be recompiled using the TX SDK 3.05 from the ODA website ( www.opendesign.com ). The extension of such files will be .TX and not .DRX anymore. We are now working with McNeel Associates to get an updated version of the DOSLIB.TX for Bricscad V12 Classic. Until such time, you can use GeoTools only with the Pro and Platinum versions of Bricscad V12. With Bricscad V11, GeoTools V12 will run with the Classic version as well. 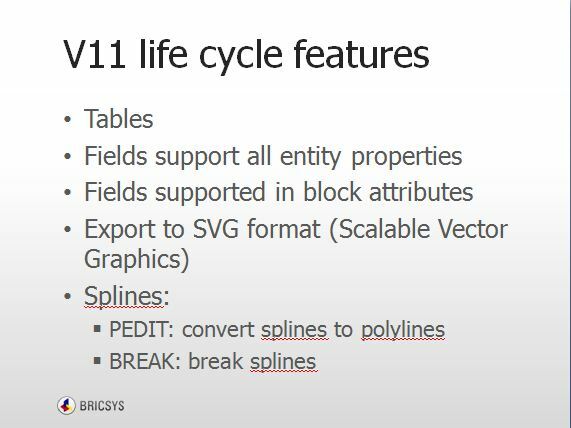 During the recently concluded Bricsys International Conference, Erik de Keyser announced that Bricscad V12 is soon going to be available free of cost for students and educational institutions. The nuts-and-bolts of how exactly this is going to be implemented is still awaited. Erik said there would be a webpage where the students and/or the universities/educational institutions can register, provide some kind of authentication and then get approved for a free license. This is certainly good news, especially in a country like India, where most universities/engineering colleges have Linux as one of their operating environments. Being the only complete CAD software that can run on Linux, Bricscad can hope to certainly derive an advantage in this space and hope to gain some attention in the educational sector. With this move, Bricsys joins market leaders Autodesk, ESRI , PTC and others who have had a long tradition investing in eductaional institutions and offering their software for free. Erik also announced a contest for students where the best original idea and application developed using Bricscad would win a prize of 15000 Euros, out of which 10000 Euros would go to the student and 5000 Euros to the school. He also announced the Bricscad dime-store where students and individuals can create Bricscad applications that should cost less than EUR 20 and sell/support it via this interface. This is again a very good initiative and reminds me of the Autodesk appStore that was launched earlier this year. Indian universities, engineering colleges and serious developer students from India wishing to build a relationship with Bricsys and Bricscad can contact me for more updates or if you have questions. In this context, educational institutions means those that offer CAD as part of their mainstream curriculum leading to a diploma or degree. It DOES NOT include training centers where CAD is taught for a fee on a commercial basis. Such organizations who are in the ommercial training business can qualify to apply for an Authorized Training Center for Bricscad status and purchase Bricscad licenses and the training kit at discounted rates than commercial licenses. The ATC status is on a yearly renewable subscription basis. VK Design Techniques in Bangalore is our first Authorzied Training Center for Bricscad and offers piping, structural, HVAC and other domain specific CAD skills using Bricscad as the training platform. The recently concluded Bricsys International Conference had other bloggers like Ralph Grabowski and Deelip Menezes as well covering the proceedings via live posts, twitter feeds etc. Wrapping up Bricsys Conference 2011 & What will happen to Architecturals? Bricscad V12 Released - Download it Now! The news that you have been waiting for is finally true and and you can experience it yourself. Bricscad V12 is now officially released and available for download. Here is the link to download Bricscad V12. This link also gets you a FREE copy of GeoTools if you are a Bricscad user from India and have purchased Bricscad from us. While you are downloading Bricscad V12, here are some other links that will help you know more about this release. V12 life-cycle features, what to expect in next 1 year? Direct modeling in Bricscad V12 is one of the key features of this new release. Here is a Youtube link to a video that shows you how it is done. In one of my last posts titled What's new in Bricscad v12 , I wrote about the new features in Bricscad V12. 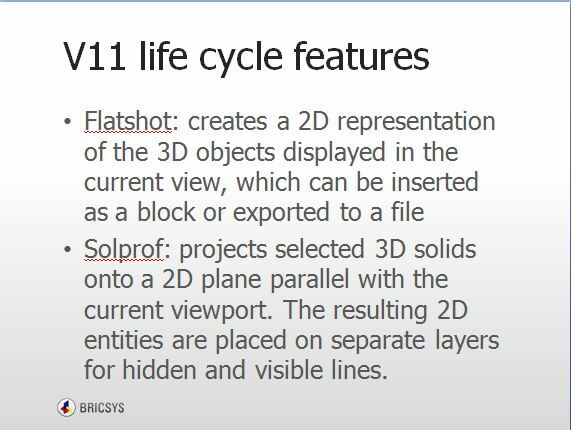 In the same post, you also read about the disclosures made by Bricsys about the additional new features we can expect to see during the life-cycle of V12 i.e in the next one year. Looking at the changes during the life-cycle brings us to an interesting observation. Bricscad is a software that evolves throughout its life-cycle. In many ways, Bricscad is like our GeoTools software which grows incrementally, often with a weekly or fortnighly update that introduces a new feature or provides an enhancement to an existing tool. With most other CAD software, you get new features with each release and only fixes and patches during its life-cycle, but not with Bricscad and GeoTools. Support for the 2010 DWG format also happened during the reign of V11. In one of my last posts, I spoke about a new Bricsys product - Chapoo. Here is a little more info about it with some slides. Chapoo is nothing but the new name for Vondle project management software. The full-fledged Vondle product will be called Chapoo Bizz and a stripped down, lean version of the same is going to be called Chapoo. I asked Erik what Chapoo meant and he said "Nothing". It is just a name that they believe is nice and easy to pronounce. Here are some more slides about Chapoo and its user-interface. This is what it is primarily intened to do. The BIZZ version brings in all the functions of the former Vondle product into the Chapoo platform. Chapoo is under development on other mobile OS platforms like Android, iOS etc. The product is expected to release by end-2011. The Bricsys Developers Conference last week opened with a 3 minute clip showcasing the various Bricsys milestones, juxtaposing it with events from around the world from that time period. Following the opening movie clip was a detailed presentation of the 10 years of history of Bricscad. On the second day of the Bricsys Developer Conference also, we had some post-conference evening fun activities again. The party was at the top floor of the Square Brussels Meeting Centre accessible via the Coudenberg entrance. The top floor had a panoramic view of the city of Brussels and inside, we had the legendary Bricsys band playing music to keep the guests entertained. Here are some pictures from the Day 2 Bricsys evening party. I could not get a panoramic view of the city outside since it was too dark. However, I managed to get this panoramic nearly 360 degrees view of the party floor with my SONY Cybershot camera. With Arthur Gan, the Bricsys Malaysia distributor and Karol Klimowicz, the CADProfi expert from Poland. With Fernando Castilla, the Bricsys and GeoTools reseller in Spain. The Bricsys band; CTO Luc de Batselier on the left. The panoramic view (but my camera did not get the best of it). The single, biggest announcement in Bricscad V12 that has got everyone talking is direct modeling. 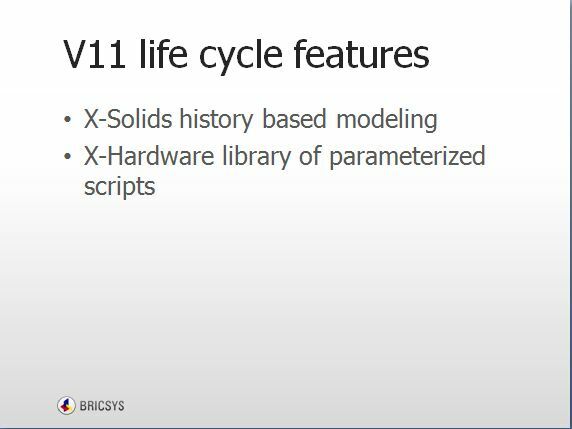 Bricscad V12 now offers Variational Direct Modeling (VDM), which is something that was pioneered by LEDAS Corporation back in 2008. On Day 2 of the conference, Dimitri Ushakov, the CEO of LEDAS and Bricsys Technologies, Russia gave an overview of all the solids modeling technologies that have been in use over the past years. His presentation made the complex world of solids modeling technologies easy to understand by an MCAD layman (like me). He began by giving a brief history of modeling technologies and followed it up with a slide which compared history-based and history-free (direct) modeling and then went to explain the differences between direct and indirect modeling. VDM offers the best of both worlds. It offers the best of history modeling and pure direct modeling. Dimitri Ushakov beginning the presentation by talking about the advent of Direct Modeling era. SolidDesigner from CoCreate, the software division of HP in 1992, which eventually became CoCreate and is now Creo Elements / Direct. CADKEY from Kubotec in 1999 (now known as KeyCreator). In the next slide, he showed some of the important milestones in the modeling world. More technical details about the differences between the two modeling techniques explained. Procedural vs Variational Modeling. As you can see from the slides, this was an extremely educative, informative yet simple presentation by Dimitri Ushakov. "In direct modeling, data is not lost in translation. Dumb data can get talking again. For instance, data imported via SAT files", said Dmitri Ushakov. This chart summed up the comparative differences between the three modeling techniques. The next three slides show how the modeling techniques work and which one is be suited for you. During the Bricsys Developers Conference yesterday, one of the major announcements was the acquisition of intellectual property rights from LEDAS. The Variational Direct Modeling(VDM) in Bricscad V12 is based on technology that was developed by LEDAS. This is now owned by Bricsys. "After this acquisition, the LEDAS team in Russia responsible for VDM will function as a separate subsidiary - Bricsys Technologies, Russia" said Erik de Keyser. Dimitri Ushakov, the current CEO of Ledas will be the new CEO of Bricsys Technologies, Russia..
Metso is a multi-disciplinary engineering company with interests spanning power, pulp and paper, mining, construction and mineral industries. They have been one one of the bold guys to experiment and invest on BRX many, many years back and this started a long relationship with Bricsys. Today, they are perhaps the most extensive BRX users and this is clearly reflected in the extent to which they have customized Bricscad. Dr. Mika Karaila from Metso gave an overview of Metso corporation followed by a demo by Seppo. He showed us how a completely customized Bricscad, known as MetsoCAD within the company, was used to automate many of the design and operating processes in their industry. Bricsys today gave us a sneak preview of an upcoming product called Chapoo which is a simple, stripped down and extremely user-friendly version of Vondle. You can use Chapoo to upload, share, view and annotate files. Unlike Vondle, you can use Chapoo to upload and transfer files to outside channels like Facebook, Twitter etc. Chapoo appears to be a simple document management system. Chapoo will run on Android devices also and Bricsys expects to find use for this product beyond CAD users. Expected to release by end-2011. Stay tuned for more info. Lightworks Artisan is a specialized product that offers rendering solution for photo-realistic rendering and real-time ray tracing. It is evident from the presentation that the the company focusses on pure rendering technology and are experts at it. Clive Davies demonstrated the features of this product as a standalone application as well as demoed some rendering of a CAD data from Bricscad. "A full commercial release is expected in a few months from now", said Clive in response to a question from the audience. ODA stands for Open Design Alliance - the creators of Teigha .DWG libraries. Arnold Van der Weide, of ODA spoke about ODA and its activities. He touched upon the relationship ODA shares with Bricsys, important milestones achieved, testing procedures implemeted and used by ODA. Arnold's talk was informative and educative. Not many would have known much about ODA and how it impacts Bricscad and vice-versa. ODA libraries are an important underlying component of any .DWG compatible software like Bricscad. It is the code that allows a DWG file to be opened when you start Bricscad and saved before you exit Bricscad. Arnold also highlighted the various OS'es which Teigh would run on. An Android version is expected by the end of this year. PDF reading capabilities are also available. He also showed a couple of slides detailing some of the plans for the future (like multi-core support, cloud etc). What ODA and Bricsys have done together has resulted in a mutually win-win situation to create a powerful Teigha library that is today multi-platform and OS-independent. During the coffee break, I had the opportunity to meet Arnold in person and learn more about ODA and their activities. Arnold Van der Weide, President, ODA with yours truly. 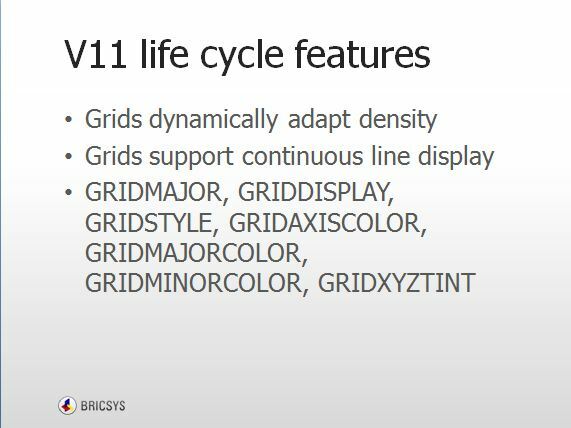 Hans de Backer, Head of Product Development at Bricsys started off his presentation giving a brief run-down of what was added in Bricscad V11. He then moved on to new features in V12 and the first slide showed the quad menu. The QUAD is the central feature and the most visible icon of all direct modeling operations in Bricscad v12. The QUAD cursor menu is central to many editing operations in direct modeling and constraints. Direct modeling is now possible in Bricscad. Menus re-organized to make it more intuitive and shorter - to prevent Up and Down arrows from appearing in long pull-down menus. Teigha 3.5, the new ODA library was used, migrated from the older 2.6 version - It took 10 developers 8 months to do it. A significant improvement that also resulted in over 1800 fixes to the libraries being reported back to ODA. New SECTIONPLANE command that is dynamic and updates the results upon change in source (unlike the old SECTION command). Section planes can be saved to blocks. Visual Styles and Page Setups will save a lot of time in drawing management and plotting operations. New raster engine, based on the multi-resolution Vondle viewer - allows to import much larger bitmaps, mush faster. The Tool palettes menu in Bricscad V12. Teigha 3.5 is the name of the new ODA library that V12 uses. Parallelization is still work in progress and expected to be fully functional during the life-cycle of V12. 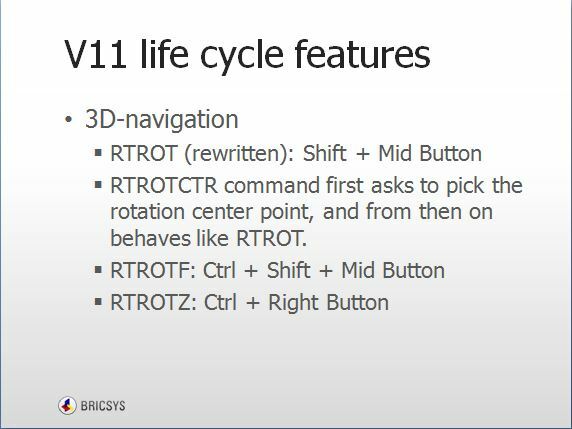 Hans concluded the presentation by showing some slides that highlight features that are still work in progress and will be implemented during the life cycle of Bricscad V12. CTO, Luc de Batselier, demonstrated the 2d and 3d direct modeling capabilities in Bricscad V12. The direct modeling capabilities in Bricscad uses the new QUAD cursor menu, which offers a very intuitive, idiot-proof and user-friendly interface that seems to guess what you want to do next. The QUAD menu highlights an edge, face or the entire solid depending on where you move your cursor. Accordingly, options like fillet/chamfer or push-pull operations on faces appear on the screen depending on what is selected. I am not an MCAD specialist and reporting this as a novice but from what I have seen, it appears to me that these tools make the operation appear extremely simple. You can touch the face and push, pull, fillet or chamfer an edge with ease. You also have the tracking cursor and edit box making its appearance each time a numeric input may be required. So, this allows for both touch-based as well as numeric entry of data. The Design Intent recognition toolbar provides a number of options to manipulate faces of solids using conditions like parallel faces, perpendicular faces, coaxial faces and the like. Luc explained that the direct modeling tools make it easy to manipulate and edit solid geometry that have been imported from external systems via SAT files etc. The second day of the Bricsys conference started off at 0930 am today with Shivdeep Garud of www.3dbrains.com demonstrating the 2d parametrics option in Bricscad V12. He shows us a bunch of linear and dimensional constraints that could be applied to a 2d drawing. www.3dbrains.com is a CAD software company based out of Singapore and India. The first presentation after lunch was by Mr. Erik de Keyser. He gave us a brief run-down on some of the volume Bricscad clients and the relationship Bricscad has had with them. Here is a slide that shows some of those large volume corporate clients. After a packed day of sessions at the Square Brussels Convention Centre, it was time for the evening party. The Bricsys evening parties have always been popular and talked about a lot. This year, it was no different and took place in the newly opened museum - MOOF which is just outside the Brussels Central train station in Galerie Horta. Looks like Bricsys likes museums for evening parties! The 2010 conference also had an evening party in a Salvador Dali museum in Bruges. Read Deelip's post about last year's party. In fact, the museum opened just a week back and we have been the privileged lot to enjoy the sights and ambience of this Tintin museum while having a walking dinner with some fantastic champagne and Belgian beer. The Moof museum showcases the popular Tintin and other world famous comics, while also depicting some history of the popular comic strip. Here are some picture from the Bricsys party. Erik de Keyser, CEO, Bricsys (L) and Torsten Moses, the Lisp guru (R) with me. Damian Harkin (Bricsys Australia), Mark Van den Bergh (COO, Bricsys), Rakesh R, Arthur Gan (Bricsys Malaysia partner) and Sander Scheiris (Bricsys). With Sander Scheiris, who, among other things handles the complete web site design and multimedia promotion activities in Bricsys. The band that played all night. Some exhibits at the museum. Ralph Grabowski needs no introduction to the CAD community. He is an invited speaker today at the Bricsys conference and is speaking on the topic: Trends in software and hardware. He spoke about the existing as well as upcoming hand-held systems like tablet PC, smartphones and the new direction in which computing is headed. He compared the situation now to that a decade back when the internet era started to become popular with the common man and started to make a real impact on our lives. Now, he says, 2011 is a year when the mobile computing is becoming real. But desktop computing is not going to die yet. He made a comparison between the Android-based devices and iOS and is betting on the long-tem victory for open systems like Android. The presentation of Bricscad add-on products from third party developers continues in the afternoon session of the Bricsys Developer conference. After the coffee break, we are now watching a presentation by WSCAD from Germany. WSCAD is a complete Civil engineering application that runs on Bricscad and offers a complete replacement to verticals like the Civil 3D product from Autodesk. The demo looked very impressive and we were shown how a TIN model can be generated from a bunch of 3d points, how cross-sections can be generated on-the-fly, and how cross-sections get updated dynamically when the defining line gets modified. The presenter then demonstrated how roadway design can be performed by creating the proposed road center line and superimposing it on the existing surface. Another highlight of this presentation was the really fast TIN model viewer that was shown. The presenter said that millions of points and faces of TIN data could be viewed much faster using this viewer than in any CAD platform. One thing that is becoming evidently clear is the increasing importance that Bricsys is laying on its web-based, cloud-based collaboration and project management software called Vondle. Being a 100% SAAS product, I will not be surprised if Bricsys will be known in the near future for its Vondle product as much as it is known for Bricscad. Vondle is perhaps the platform that will lead the way into a cloud-based strategy going into the future. In the presentations so far, I have heard as much or more about Vondle than Bricscad. Workflow management - a process to approve documents by multiple people. Collaborative tools to manage single/multiple database and share information across users. The data repository which allows data to be transferred to external systems like Bricscad. All elements are easily customizable via an API which exposes all of it to developers. Jurgen also showed some cool, new features to create forms and user interfaces with ease and connect them to databases even more easily. Here is a userform that was created in front of us in a couple of minutes and saved into the database. The Vondle presentation in progress. You can also see some more pictures of the Vondle interface. The Bricsys online ordering system, the support system and the entire database of its customer, prospects, evaluation users etc are completely managed and implemented in Vondle. Vondle is a complete project management software from Bricsys that can be used to store a central database that can be accessed, managed and manipulated by multiple-users using multiple channels. In the presentation titled BricsCAD and database applications, Daniel Marcotte showed how BricsCAD can connect with Vondle and exchange information between the two applications. He showed how entities in BricsCAD can be tagged to database records and how additional information from Vondle can be displayed all within the BricsCAD environment. Being able to share data with Vondle in a two-way direction is a very powerful feature that bridges the two software applications. Bricsys recently upgraded the internal support system that they use for partners as well as for the end-user. Sander Scheiris of Bricsys demonstrated the capabilities of the new support system along with the presenter from CADProfi. With the new support system, it is now possible for third party applications to use and offer the same support system that is used by Bricscad. Multi-lingual support is now possible as well using the efficient despatch system which allows Bricsys partners based in other countries to work in tandem and translate the support request back into English so that they can be answered by Bricsys and/or the third party developer. In the fourth presentation of the day, Poland-based CADPRofi showed off its CADProfi suite of products that offer various parametric CAD design possibilities in disciplines like HVAC & Piping, Electrical, Architectural, Symbols and more. Their products are translated and available in 22 languages. CADProfi invites CAD companies across the world to become its partner/reseller to represent its products in various geographies. The second presentation in the morning session of the Bricsys conference is an overview of all new features in the API's. The CTO of Bricsys, Luc de Batselier, along with Torsten Moses, the brain behind the Lisp engine in BricsCAD present this to us. Torsten highlighed about the extended support Lisp provides in BricsCAD supporting most of the VL, VLA, VLAX and VLR functions offering the highest level of Lisp compatibility. He also stressed the faster Lisp speed in BricsCAD compared with AutoCAD. Our tests have also indicated that BricsCAD Lisp is faster than AutoCAD lisp in many operations, if not all. Read this post Is Bricscad Lisp faster than AutoCAD Lisp? for more info. Luc talked about the features (existing and planned) in the new .NET API as well as the features in the API's for the Bricscad Linux platform. Here is the complete agenda for the Bricsys developers conference. The first picture shows you all the stuff that we are going to see at the conference. The second picture lists out the evening activities - the famed Bricsys party that is part of every Bricsys conference. The Bricsys developers conference has gotten off to a start with the CEO Erik de Keyser giving a brief overview of Bricsys' 10 year journey since 2002. The milestones include moving away of BricsCAD from IntelliCAD to the introduction of the BRX API and the porting of Bricscad to Linux. Erik highlighted the independent direction which Bricsys is charting for the BricsCAD software. Here are some pictures from the inaugural address. The Bricsys Developers Conference starts today at the Square Brussels Convention Center. I got here yesterday and look forward to writing more about the conference. The weather is pleasant and is a good 18-24deg C during the day which makes it even more enjoyable to go around the streets of Brussels and do some sight-seeing. Back in June, we announced the special promotion for Bricscad software that was launched exclusively for the Indian market. This promotion had a shelf-life until Bricscad V12 is released. That date is now almost round the corner. I am writing again to remind all that this incredible offer 'with many Additional Advantages' is soon going to be over. Next week, Bricsys is hosting the Developers and Partners conference in Belgium and, although it has not been officially announced anywhere, V12 release is on the agenda with a number of other surprise annoucements, all of which are going to benefit you directly or indirectly. Now is the time to book your BricsCAD orders - the advantage is that you will get V12 at no extra cost when it is released. Additionally, you pay substantially lesser now than after the V12 release. I will be in Belgium from October 3rd to 9th. Please stay tuned to my blog and our facebook pages to know more about what is happening. We will continue to offer our GeoTools software FREE with every purchase of BricsCAD. You will hear some new annoucements from us concerning GeoTools as well in the coming months.